The author’s recollections of a sporting boyhood will strike a chord with many readers, though few will probably have managed to participate in and/or watch as much sport as Mr Corns. As a cub and then a scout, at primary and then grammar school, in informal ‘gangs’ and then in clubs, he played football, cricket, rounders and Korfball, as well as swimming, running and long-jumping. He watched fine cricketers on the Green and world-class athletes at the News of the World ground, and he writes about it all with enthusiasm and total recall. My family home was in Heaton Road, North Mitcham, which was badly damaged during the war. my grandfather, returning to our home in early 1946. Numbers in the margins refer to locations shown on the map on the back cover. for the fielders and the drivers. Road off Church Road. With great pride I pinned my competitor’s number, G3, on my running vest. Memories can be very blurred, especially when you cast back to events over 50 years ago. and open air baths at Purley Way and Tooting Bec. pigeon racing and bowls. Very simply, I ran out of time in my youth. introduced to sport which has given me so much enjoyment. The game was very popular in South London with over 20 clubs, some with two or more teams. Derby and one called Esperanto, as adopting a common language was a popular theme then. meet fit and athletic girls. During this period Tooting and Mitcham were in the Athenian league and later the Isthmian league. game. They were not disgraced and the whole town was uplifted by the magnificent performance. to me… To this day I wonder why I didn’t collect the signatures in an autograph album like others. hits to the boundaries for four and the occasional six into the big trees or into the surrounding roads. the bus home to Figges Marsh. of the cubs. Both were inspirational people who gave their time freely to this splendid organisation. besides the district and county camping competitions. used the facilities for training – I may be wrong. During this period Mitcham had its sporting heroes. athletes in their club colours on their way to Brighton. It all happened in Mitcham! City on 2 July 1938.
off Windmill Road and consisted of a large reception hall with individual dressing rooms there off. them ready for the next onslaught. 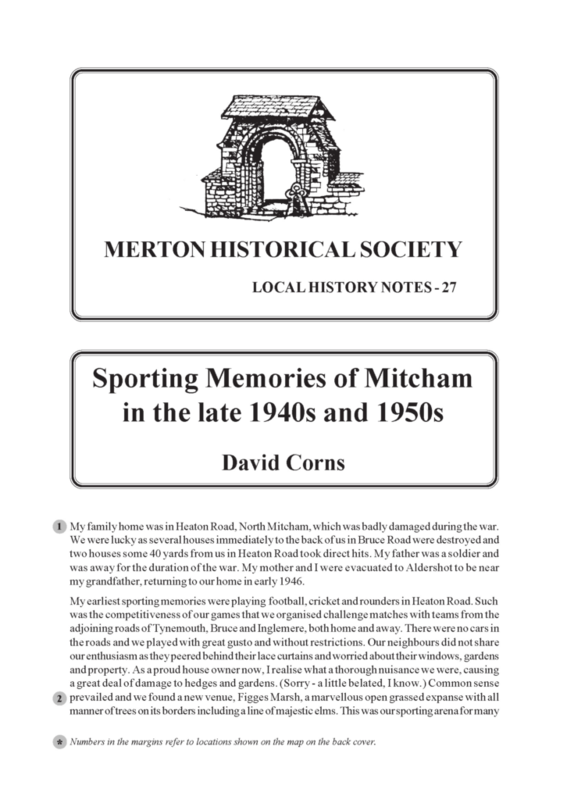 This entry was posted in Publications, Local History Notes and tagged in lhn, mitcham, modern mitcham, Reminiscences, sport.